How to wear a Strappy Crop Top! Congrats on this beautiful set! Great Set of the Day !! Congrats !! This versatile cotton crop top is a summer staple. Pair it with a pleated floral midi skirt. 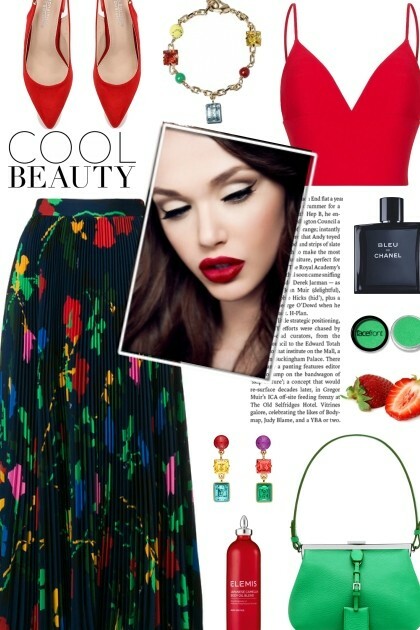 Accessorize with red high heel shoes, a gorgeous mini bag and matching Louis Vuitton necklace and earrings. neverorever ,	haikuandkysses,	Vampirella24,	Diane1234,	masayuki4499,	QueenRachie71 ,	B1anca,	Aida Susi Silva	e altri 33. How to wear a Graphic Applique Bodysuit! How to wear a Puff Full Sleeve Crop Top!